For the first time, a breakthrough moisturizing formula combining 89% Mineralizing Thermal Water with Hyaluronic Acid, boosts your skin's resistance to elements and visible aging caused by pollution, stress to skin, and fatigue. The 100% transparent formula is so versatile it can be used as a standalone moisturizer, as the first step in your skincare routine or as a boost to your regular moisturizing or anti-aging routine. Mineral 89 is a lightweight, fast-absorbing moisturizer. It absorbs quickly into skin leaving it feeling comfortable, softer and hydrated. Pure and clean formula. It has a lightweight feel of a serum but moisturizes like a daily lotion. 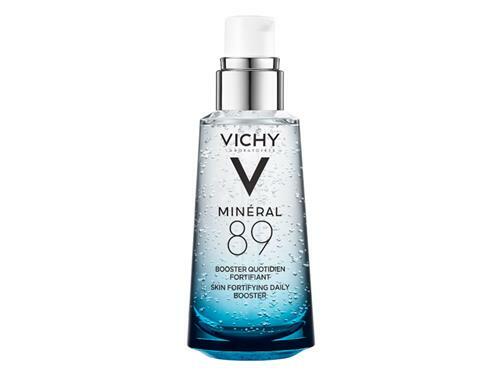 With only 11 Ingredients and high concentration of Vichy Mineral Rich Water, Mineral 89 delivers intense hydration along with a daily dose of strength for your skin. The hero ingredient, Vichy Mineralizing Thermal Water, is pure and naturally rich with essential minerals. Sourced from the heart of the French volcanoes, after a millennial path down to a depth of 13,000 feet, Vichy Mineralizing Water charges itself with 15 minerals to help strengthen the skin's moisture barrier and protect skin against external elements. 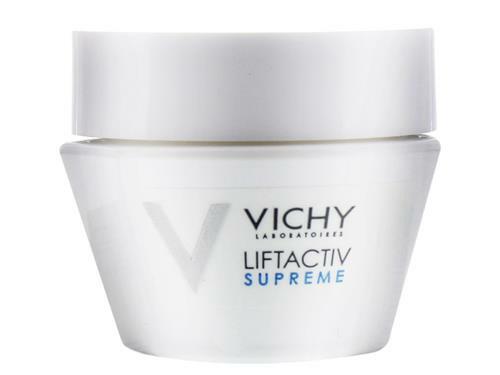 Tell us your thoughts about Vichy Mineral 89 and receive 50 rewards points! My skin reacts to almost all serums, except this wonderful one. It adds a good amount of moisture but is not greasy or heavy at all. No breakouts, no irritation. I feel in love with it while visiting France over the summer and raiding the drugstore finds. When I returned, my aesthetician commented that my skin looked healthy and hydrated, even though I had just had a nine hour plane ride. I'm so happy I can get this from LovelySkin. I used a different hyaluronic acid gel product that was similar to this that worked awesome! So to save some money, I tried this product as an alternative, and it was not as effective. I was looking for additional moisture over the winter months as my skin feels extra dry, but I don't know that this product helped with that. It has a nice texture and is not oily, so I do like the product, but it does not leave my skin feeling moistened and plump as I hoped it would. I was excited to try this, but I didn't really like the way it felt on my skin as opposed to other brands. I only used it a few times. This thing is amazing!!! It moisturizes your skin but dries down like water, just like magic! Leaves your face with a nice bounce and healthy glow. I love this product. I will buy the full size next time. Very light and clean on the skin. Very moisturizing and absorbs well plus the prize is affordable compared to other hyaluronic acid. I highly recommend it. Very soothing and hydrating. Makes my skin glow and soothes redness on my skin. Has helped my perioral dermatitis by reducing irritation and red skin. Very light and good for all skin types, including oily like mine. This product helped my skin look smoother. I love everything about this product. My skin looks great, feels good to apply and really has good stuff in it. I use it with a moisturizer unless I am applying complete makeup and then just use it without the moisturizer. My skin loves the healing power of this product. It clears up problems and clears my skin. Love it! I use it morning and night. Love this product. I give it a 10 because after cleaning your face it’s the next thing you can do to make your face glow, feel smooth and encased with wonderful ingredients. My face feels wonderful when I put my foundation on and it goes on so smooth after using Mineral 89. My face feels so good when I use this product. It's rich with minerals that are good for your face. My daughter has been using some acne products that burn her skin and cause extreme dryness and flaking. When she tried to add a regular moisturizer, her breakouts got worse. The Mineral 89 provides the perfect amount of lightweight, gel moisture without making her acne worse. I'm so pleased to have found this and that she feels more confident because her skin is clearing! Very nice, light moisturizer. Maybe not enough for the mature skin for the winter, but ok for summertime. Well Vichy has turned out to be my all-time favorite product line. My skin is sensitive and I am on the mature side of the fence, and all of the products I've tried have worked unbelievably well. 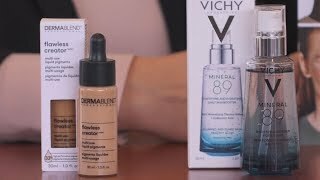 This is the second step in my regimen and then I use the Vichy Aqualia Thermal Dynamic Hydration Rich Cream, the best thing about this line is the wonderful smell. I am really picky about smell especially on my face and this is one of the best.Try a sample if you don't believe me and oh yes I might be in the getting older range but because of using so many of these awesome products I still rock too. This product absorbs quickly and leaves skin very supple, I’ve used other hyaluronic gels before but this one surpasses them. As your skin ages, it’s vital to moisturize, and this product is perfect in addition to a good moisturizer. Love this, I tried it as a sample from LovelySkin and bought 2 more to stock up. Makes my skin feel tighter/especially helping the pores. My 79-year-old skin feels and looks better after applying this. 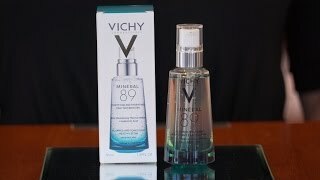 Vichy Mineral 89: It Works! I purchased this moderately priced product as the result of a previous free sample of the same stuff. (That's just smart marketing, LovelySkin!) It is different in that it is clear, not lotion-y and -- bonus! -- a little bit goes a long way. I noticed smoother, healthier looking skin on my 68 year old face within a couple of days. This one absolutely works for me and I will buy again in the future.